Buon Giorno! Over at Geeks Who Eat Headquarters we are celebrating all things Italian! 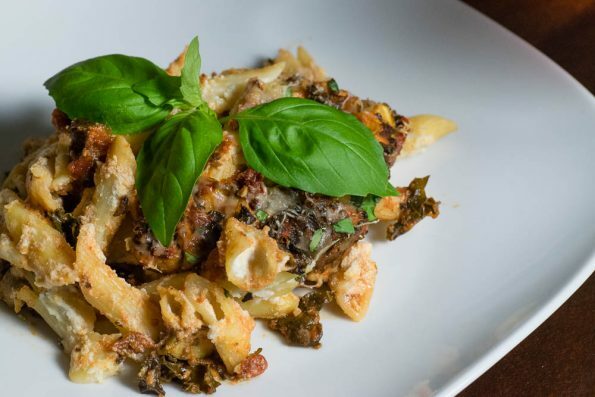 With a little help from our friends at Fry’s Food Stores (or whatever Kroger is in your neck of the woods), we are venturing into the realm of Italian recipes with a Fully Loaded Veggie Pasta Bake! Fry’s is currently running their Taste of Italy promotion. This means that your local Fry’s/Kroger Store has a slew of delicious Italian products. With all of these wonderful products to choose from, we decided that we really wanted to do an entree recipe. We tend to focus a lot of tacos for entrees, so this was a great way for us to think outside of the box. One of the specials being offered is a buy one get one with Orti d’Italia Pasta Sauce and Di Martino Pasta. 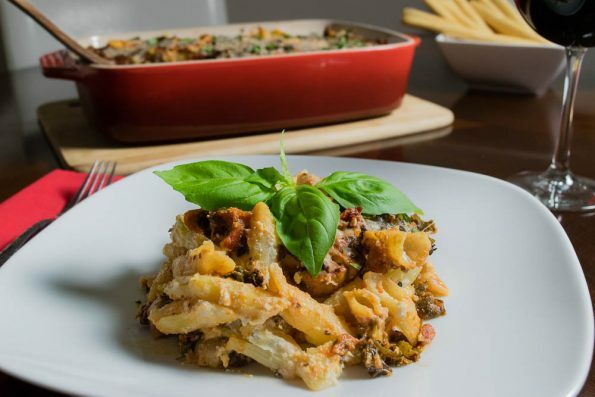 This was perfect, we figured we’d try our hand at a pasta bake. 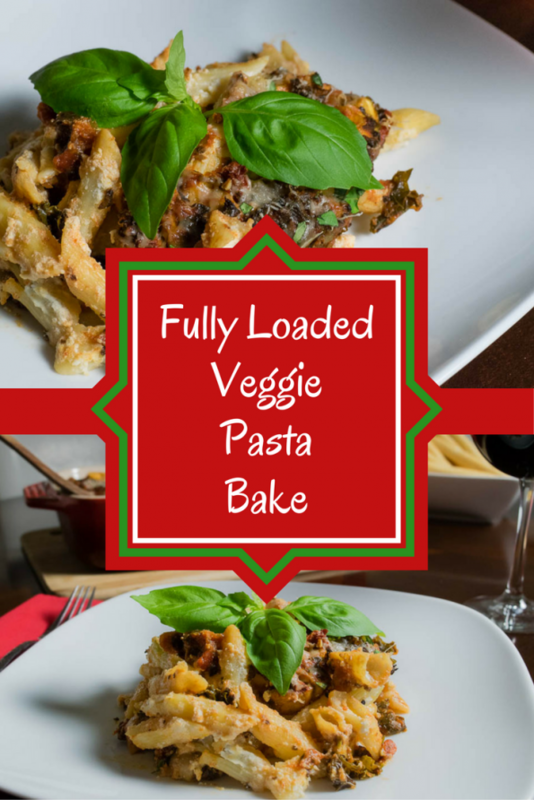 The result was this Fully Loaded Veggie Pasta Bake! This dish is a perfect meal for the whole family and is easy to make. Loaded with veggies like kale, mushrooms, and zucchini, you can feel a little bit better about eating the copious amounts of cheese in this pasta. It also pairs well with the Taste of Italy Tradtional Caprese Salad and a nice red wine. Have you visited Fry’s Food Stores Taste of Italy display? What were your favorite items? Do you have your own recipe that is a Taste of Italy? We’d love to see it! Leave a comment below or use the hash tag #GeekEats! Until next time, ciao! Heat olive oil. Make sure pan is big enough to hold sauce. Add mushrooms, zucchini, and kale. Add pasta sauce, garlic, and black olives and bring to a boil. Turn heat down and simmer, stirring occasionally. Drain pasta and combine it in a bowl with the Ricotta and Pecorino. Pour half of the pasta sauce mixture into a 9x13 baking dish covering the entire bottom. Carefully spread pasta and cheese mixture into the baking dish. Remove from oven and top with Parmesan. Bake for 3-5 more minutes until cheese is melted. *The Geeks participated in an Influencer Challenge with Fry’s Food Stores to facilitate the creation of this recipe and will be compensated at its completion; opinions are wholly our own. View our Disclosure Policy for more info.